¡Descubra nuestra casa tradicional muy especial para 1-4 personas en el sureste de Creta, en un tranquilo pueblo de montaña a unos 20 minutos en coche de la playa! Disfrute de la vista sobre las montañas hasta el mar desde su terraza. La villa Angeliki es una casa independiente con su propia terraza con fantásticas vistas al mar y a las montañas. La gran terraza tiene salida desde el dormitorio de arriba. El apartamento tiene 2 entradas, una desde el jardín que conduce a la sala de estar y otra desde el dormitorio de arriba. La villa está totalmente amueblada y cómoda. En la primera planta se encuentra la terraza, el dormitorio y el baño. En el suelo se encuentra la sala de estar, el comedor, la cocina, el otro baño y el patio. Le proporcionamos también ropa de cama semanal y toallas se pueden entregar dos veces por semana. La máquina de whaching se encuentra muy cerca del apartamento, no dentro del apartamento. 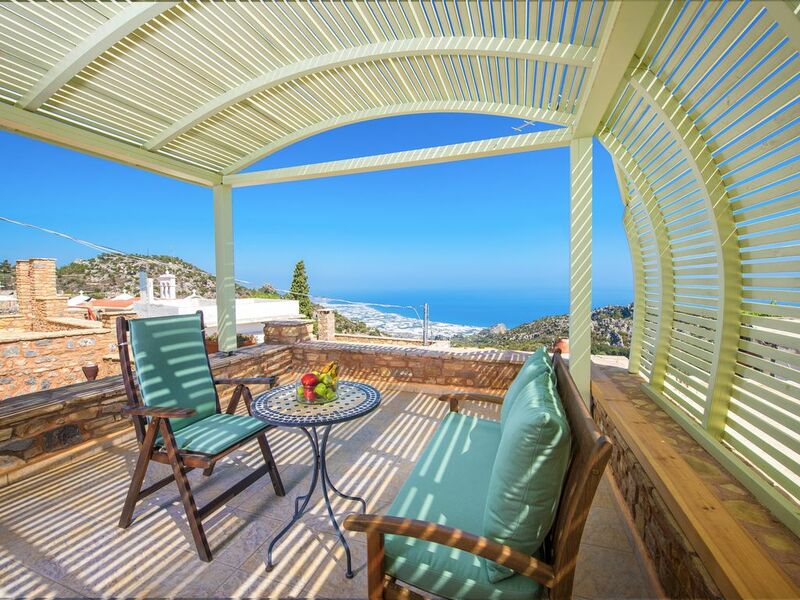 View to the Lybian sea and to the mountains! We were very well received by Giannis and Kyriaki. They advised us very well on the sites to visit, the restaurants and amenities around. We felt at home. The apartment is so nice, very well equipped and clean with a very beautiful and big terrace where we took all our meals. It was relaxing and the view absolutely stunning!The beaches and kanyons are not far away. Many thanks again to Giannis and to his wife for the warm welcome. Thanks for your kind words Mike! We will be very happy to have you as guests again sometime. Hosting lovely people like you it is our pleasure. Für unsere Hochzeitsreise haben wir uns das beste Reiseziel ausgesucht. Ein kretisches Bergdorf weitab vom Straßenverkehr und herrlichem Ausblick aufs Meer. Unsere Ferienwohnung mit zwei Eingängen war genau wie in der Beschreibung. Am oberen Eingang befindet sich ein kleines Badezimmer mit Dusche, das Schlafzimmer und die riesige Veranda mit Meerblick. Es führt eine Treppe nach unten ins Wohnzimmer und in die Küche, dort gibt es ein weiteres Badezimmer. Das fanden wir sehr angenehm. Es war alles sehr gepflegt und gut eingerichtet. Die Küche ist recht klein, trotzdem haben wir darin sehr oft und gerne gekocht. Die nächste Einkaufsmöglichkeit ist in Ierapetra mit einer Auswahl an Supermärkten, darunter auch Lidl. Unsere Vermieterin Kyriaki hat uns mit kretischen Leckereien begrüßt und uns viele wertvolle Tips für Ausflüge gegeben. Wir fühlten uns bei der Ankunft sofort sehr willkommen. Im Dorf kann man schöne Rundgänge machen, die zahllosen kleinen Gassen sind voller Überraschungen! Vom Dorf aus bieten sich mehrere Wanderungen an, es gibt zahlreiche, gut markierte und von duftenden Kräutern gesäumte Wege in alle Richtungen. Der Aussichtsberg hinter dem Dorf lässt sich problemlos erwandern, ohne Ausrüstung aber mit gutem Schuhwerk. Die Ausblicke sind atemberaubend! Für Strandbesuche können wir Mirtos und Tertsa wärmstens empfehlen, hier scheint die Zeit in den 70ern stehengeblieben zu sein. Giannis und Kyriaki sind sehr liebenswerte Vermieter, mit denen wir auch nach unserem Urlaub noch in Kontakt sind. Kurzum: wer einmal dort war, möchte immer wieder hin! Diese Ruhe und Gastfreundschaft sind einzigartig und sehr sehr wohltuend! Vielen dank Silvia und Peter für Ihre freundlichen Worte! We are very glad that you have chosen Anatoli Traditional Villas for your honeymoon and that you enjoyed your stay. We are also very happy that we had the opportunity to meet you and we enjoyed a lot your beautiful company. Our best wishes for your marriage and we hope to see you again in the future! A wonderful villa with everything you need for your stay. The views from the villa are stunning. The village is quiet so you are not disturbed by noise. Giannis and Kyriaki are wonderful hosts and on hand if you need them. The information they provide about the area is useful and informative. We would like to thank Giannis and Kyriaki for being wonderful host and allowing us the pleasure of staying in their beautiful villa. Thank you very much Mike and Anne that you took the time to submit this beautiful review. We are very glad that we have met you. We wish you the best and you are always welcome! We stayed at Anatoli Traditional Villas for one week in August. Giannis and Kyriaki were fantastic hosts and very lovely, genuine, helpful people. The villa was very clean upon arrival, and Kyriaki was available to text at any point if we required something. The location is great, amazing views of Ierapetra and the coast and so peaceful and quiet, the perfect get away break. On the final evening Giannis and Kyriaki invited us over to their home and they cooked some beautiful traditional Greek food and we shared some homemade Raki, this was a lovely touch for us and we loved getting to know them on a more personal basis. I would recommend this accommodation to anyone looking to visit Crete, and we will most defintely be back. Thank you very much Sarah & Danny! We are happy that you have met you and we hope to see you again in the future!! Very nice hotel. Absolute tranquility and relaxation with incredible sea views .. Great canyons for hiking! We enjoyed wonderful food from Gannis's mother and local raki from his father. Yannis and kyriaki served us smiling and kind in what we needed.Fantastic environment and very good service.Thanks for everything! Many thanks Jennifer and John! Always welcome! Relaxing with magnificent views !! Perfect stay ! Excellent service, warm and friendly people, very good location, very nice, comfortable and clean apartment with incredible traditional architecture and decoration. Giannis and Kyriaki are great. We were welcomed with family wine and Cretan sweets. At home there was everything for our breakfast like honey butter Cretan nuts, water and when we left we offered us gifts. Thank you very much Adam for your kind words! We are very happy that you have enjoyed your stay at our complex and we hope that you see again one day! Podrías encontrarnos en google maps como Anatoli Traditional villas.